Are you looking for the latest web design releases that match the modern-day web standards? You’ve reached the right place. 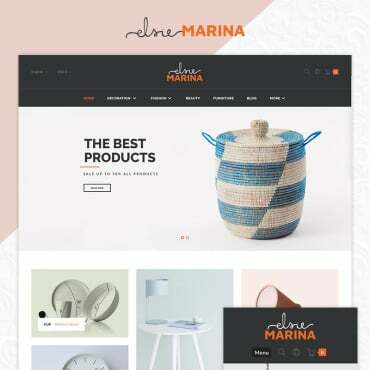 In the showcase provided below, you can find 20+ website templates that are compatible with the latest versions of the popular CMS and eCommerce platforms. 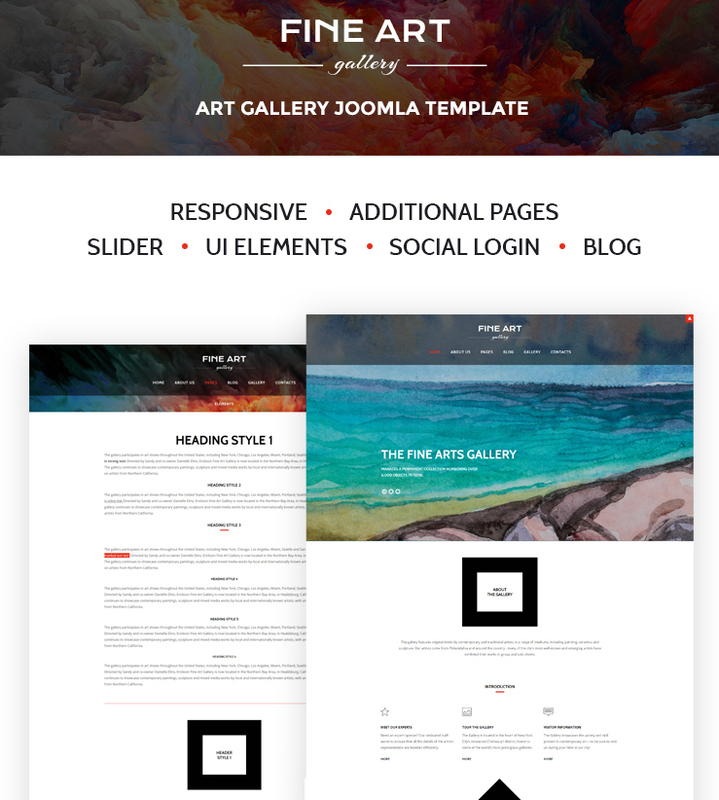 All of the premium-quality web themes are available for download from templates.com. All themes are fully editable and feature 24/7 support. Custom theme configurations and premium extensions are provided for the worry-free customization of the ready-made web designs. 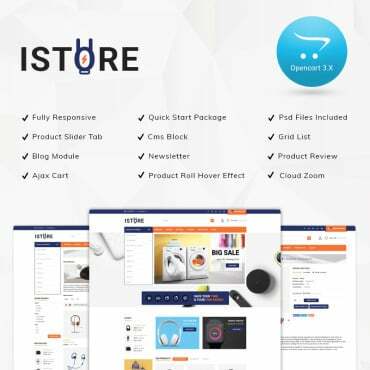 This PrestaShop template is created by a team of professional designers, so it will make any website work to its full potential. The template’s architecture, easy but still efficient, allows you to use it for almost any sports and travel website. The neat and well-balanced layout of the template helps you promote lots of content on a single page, without limiting its readability. The template is enhanced with a number of the custom modules, which are intended to make the shopping experience on your site more enjoyable. 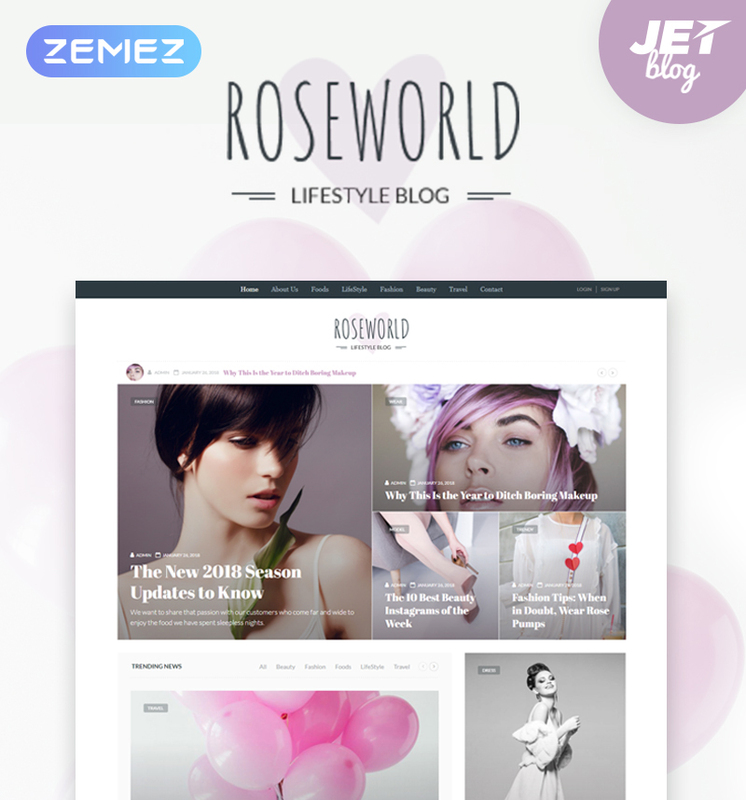 Lifestyle Blog WordPress Theme is a clean and up-to-date design for personal and business projects. It’s a blend of visual aesthetics and functionality. The design was created with valid, semantic code and the most current web design trends in mind. It won’t take you much time to change the design of your business style. Neat, valid code and explicit guidance will help you in editing this web theme exactly how you desire. 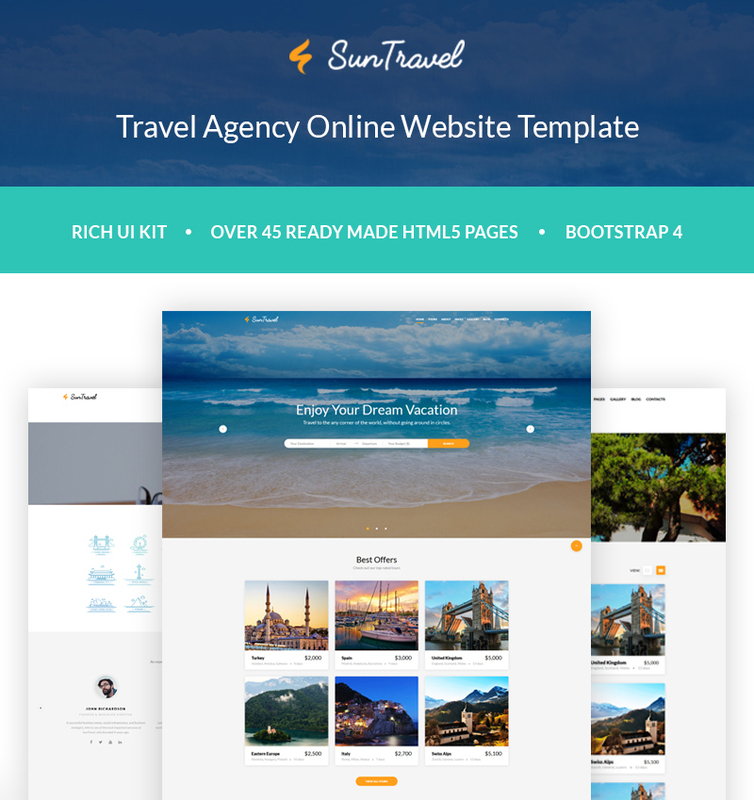 Create your travel agency website using this responsive Bootstrap website design. 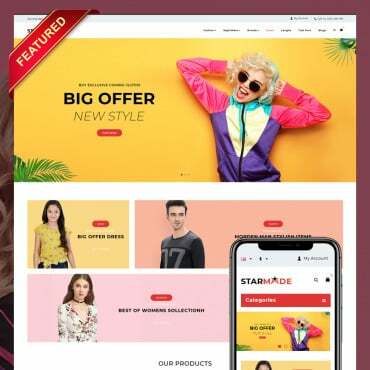 The key features of this theme are readability and user-friendliness that are provided by professional usage of colors and legible typefaces across the well-organized design. This amazing web theme is also well-documented and provides expert 24/7 tech support. If you need to put up a decent, helpful website, this design template with styled texts and engaging website content sections can be an outstanding alternative. 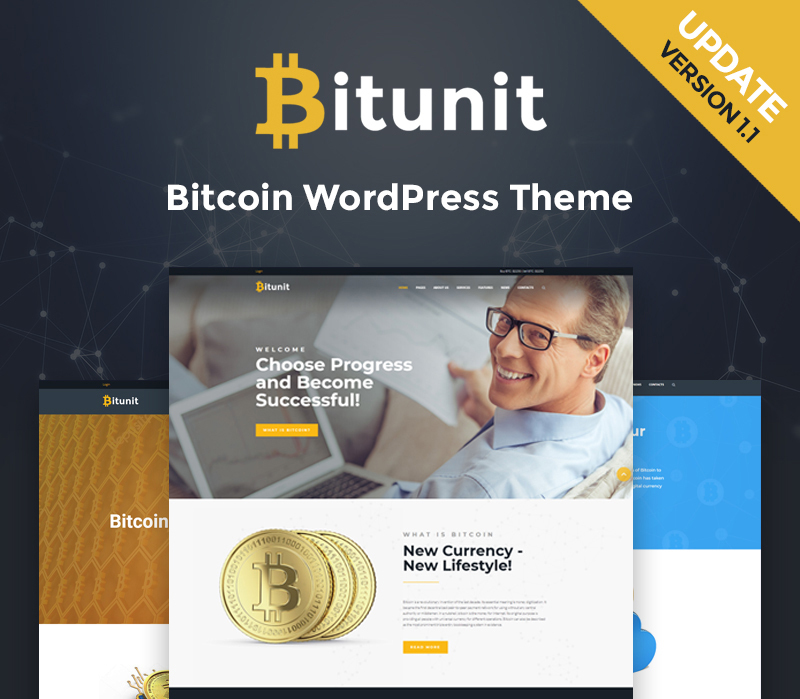 This Cryptocurrency WordPress Theme boasts a straightforward, eye-catching design supplied with a variety of multimedia options. 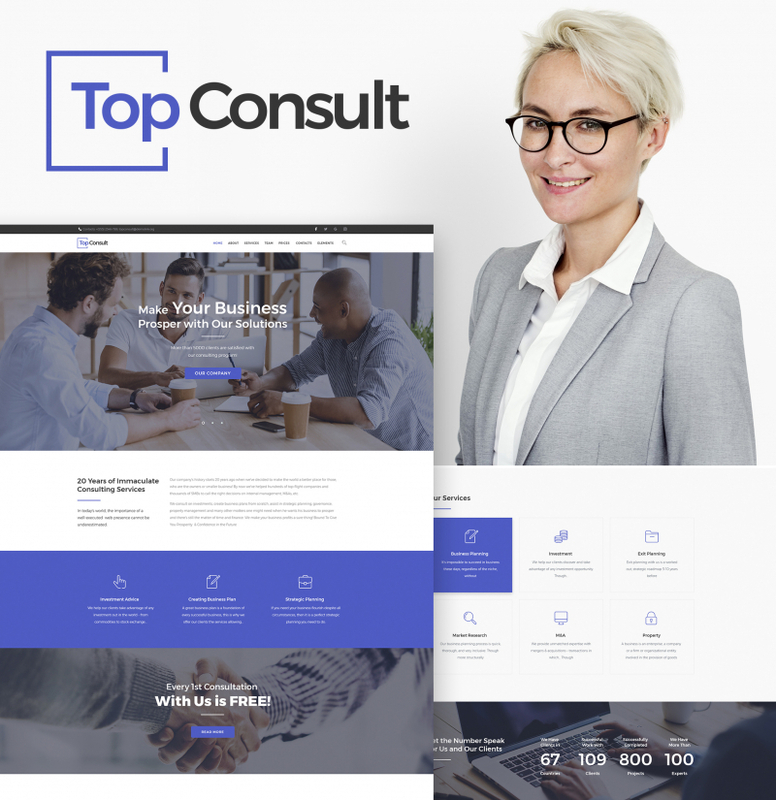 This template will be the best fit for business and financial web projects. The page layout arrangement allows you to organize quite a lot of content on a single web page. 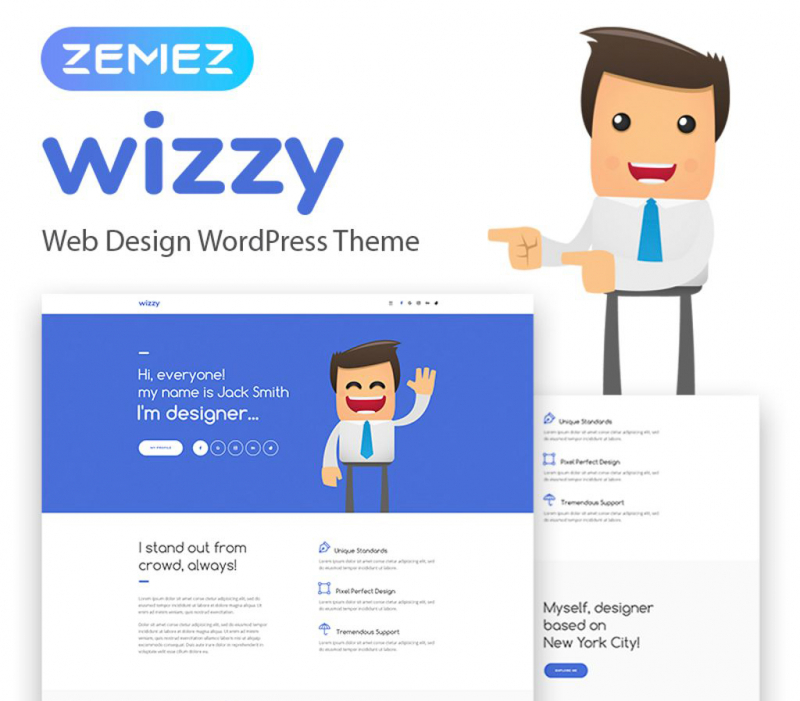 The vast majority of the theme settings can be changed immediately through WordPress customizer. This web template is very simple to install, manage and improve. Being integrated with popular social networks platforms, the template shown here can be an ideal tool to get in touch with your clients. This particular website design can certainly bring some power to your web site’s look. Intense is a responsive web solution suited to be used for a range of purposes. It contains a collection of the niche-specific skins, which you can use for free. 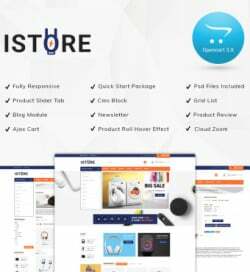 With this custom theme, the customers will be able to reach your webpage using their smartphones since the content will successfully fit any monitor resolution. The great outcomes are achievable due to this theme’s SEO-friendliness, usable features, and clear yet catchy design. 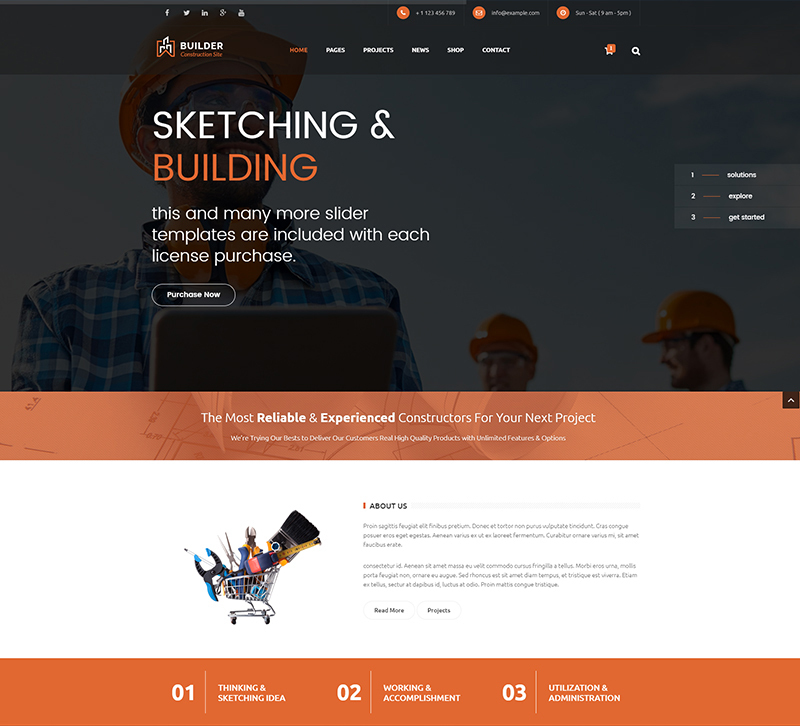 Builder is a professionally designed and developed HTML5 theme. 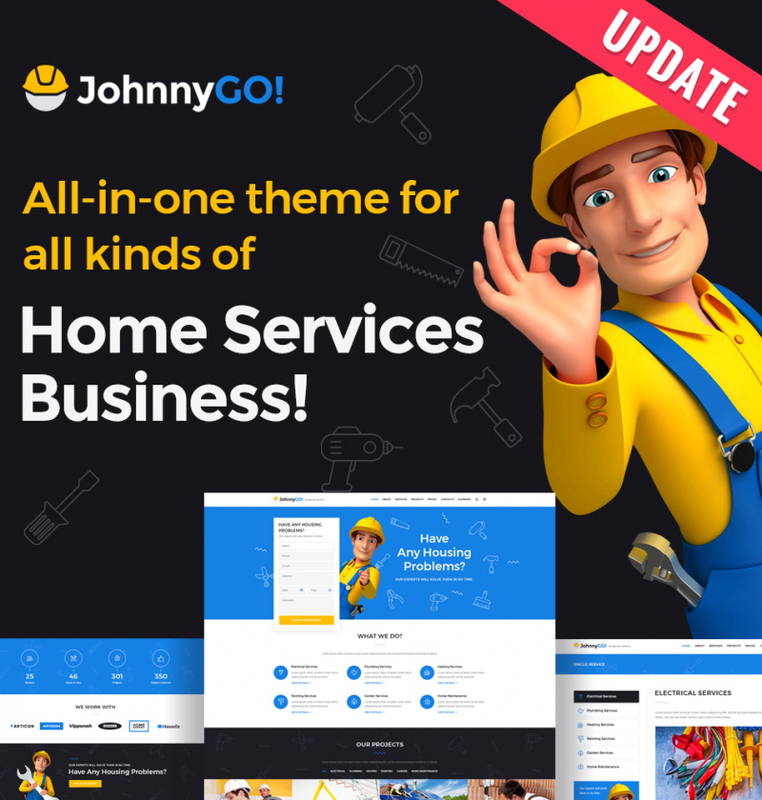 This theme will be a good choice for construction companies and can turn into quite an efficient resource for promoting any kind of products or services. SEO-friendly, it will be easily found by potential customers regardless of what search engine they are making use of. The template is designed for readability and best user experience in mind. This feature-rich web theme can give vast opportunities for your web resource. 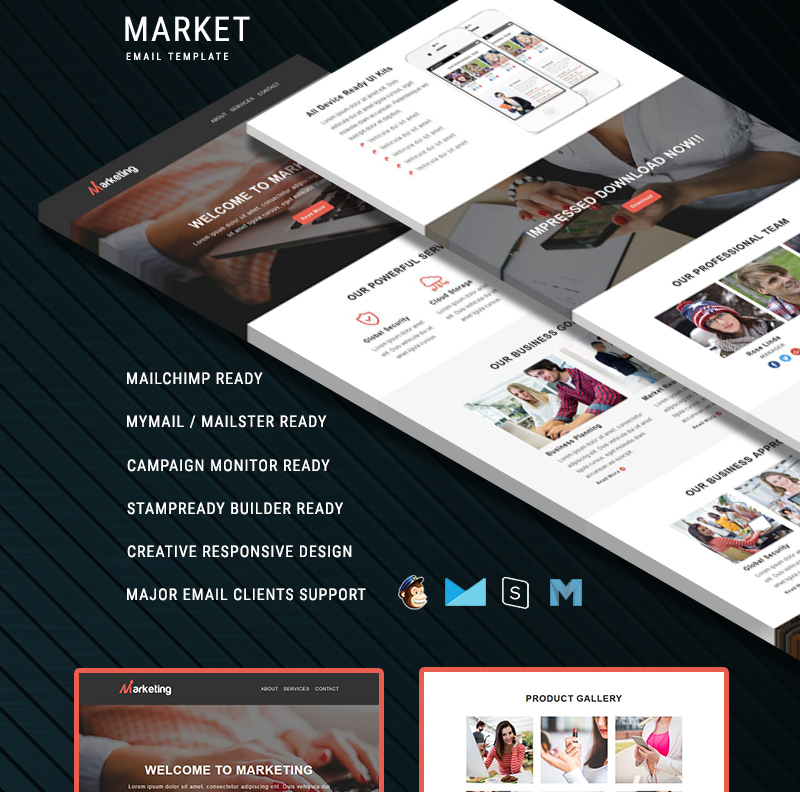 This theme is made for web designers and freelancers. It is also totally responsive, so your website will be correctly shown on any device. Grand Vector is a multipurpose solution, which contains a number of working forms, modules, and extensions that are intended to boost the functionality of your web resource manifolds. 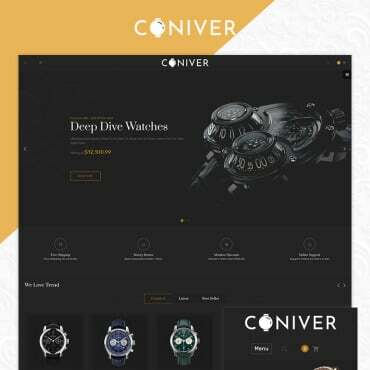 The theme includes neat animation effects and a rich UI kit, which is intended to help you build a functional and visually luring web project. 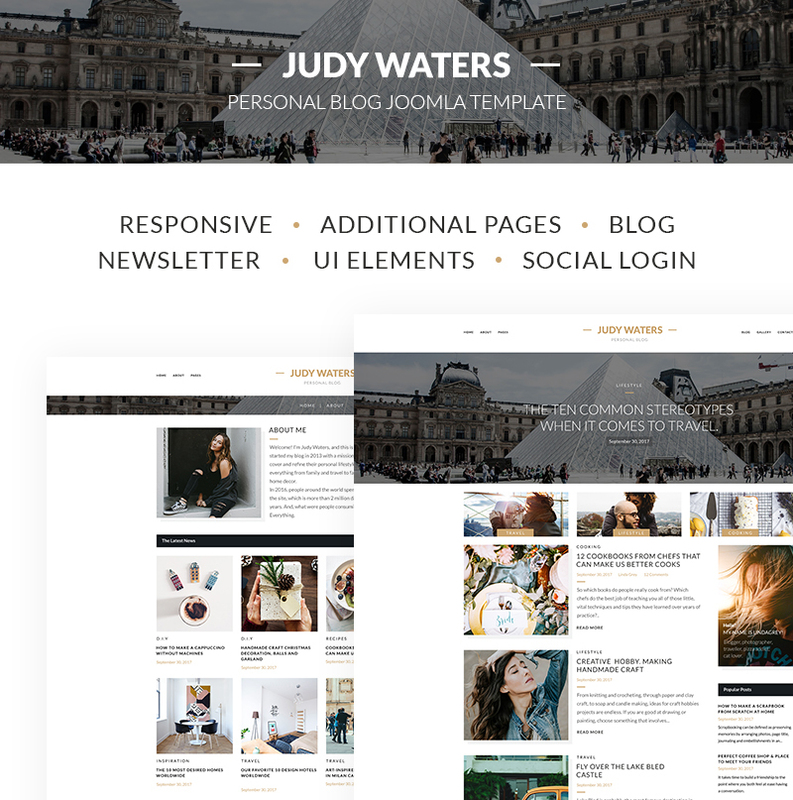 Judy Water is a 100% responsive Joomla template created to bring an advanced and high-quality look to your personal blog. The sleek layout makes it possible to utilize it for a number of other purposes as well. SEO-friendly, it will be easily found by potential customers regardless of what search engine they are making use of. This amazing theme is also well-documented and comes with pro 24/7 support. If you choose top-notch and expert web layout, choose this template for your blog! 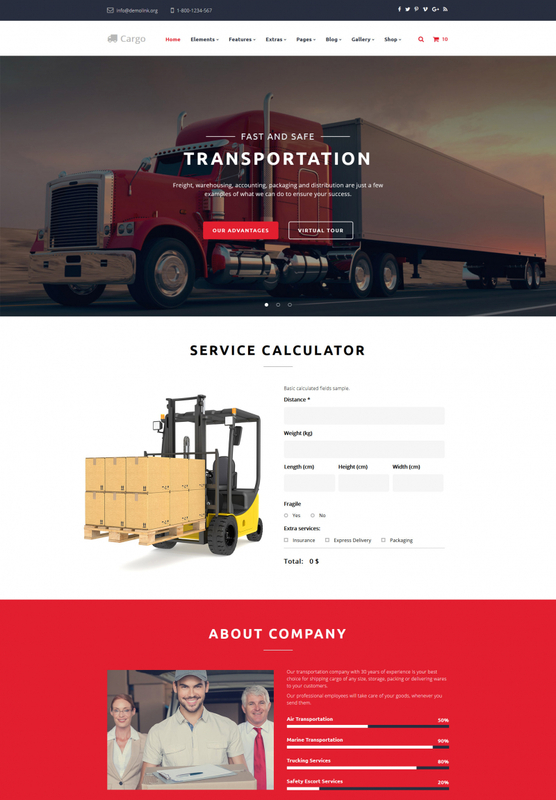 The transportation website design also comes with a number of impressive options that ensure an easy navigation and user-friendly interface. 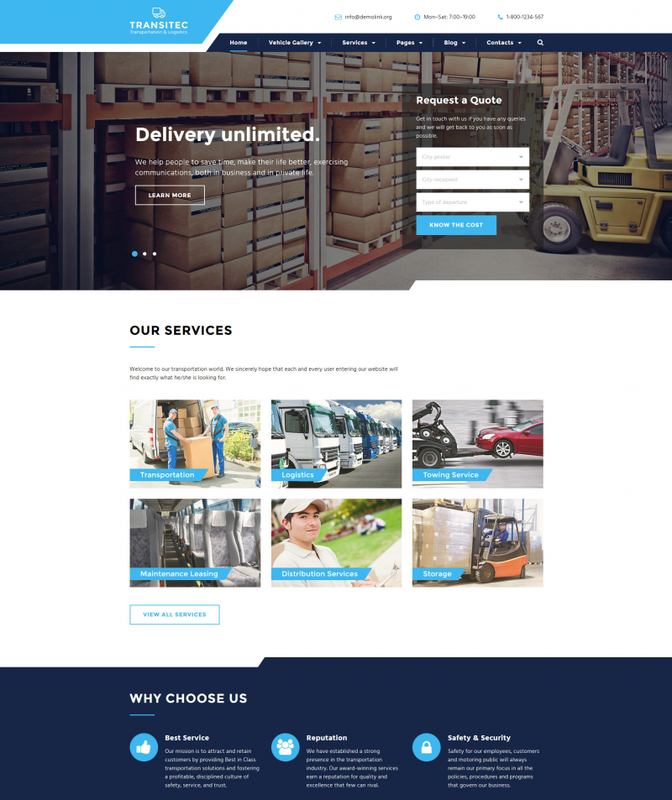 This web theme will be a great choice for transportation and logistics companies. Dressing up your online venture by using this design and style, visitors will have little doubt that you’re a specialist in what you do. Considering that this theme is responsive, it will have an exceptional look on screens of any size and resolution. Establish your designer portfolio on the web using this modern-day WordPress theme. Developed with neat and valid HTML5 and CSS3 standards, this responsive Bootstrap website design will breathe clean air into a photographer portfolio, photo portfolio or professional photographer portfolio site. If you choose your venture to be seen on the web, then you should try this WordPress theme. Well-organized content blocks allow web surfers to find out about your most up-to-date news and products in an easy-to-comprehend fashion. This particular Bootstrap website template is loaded with several functions that ensure splendid operation. 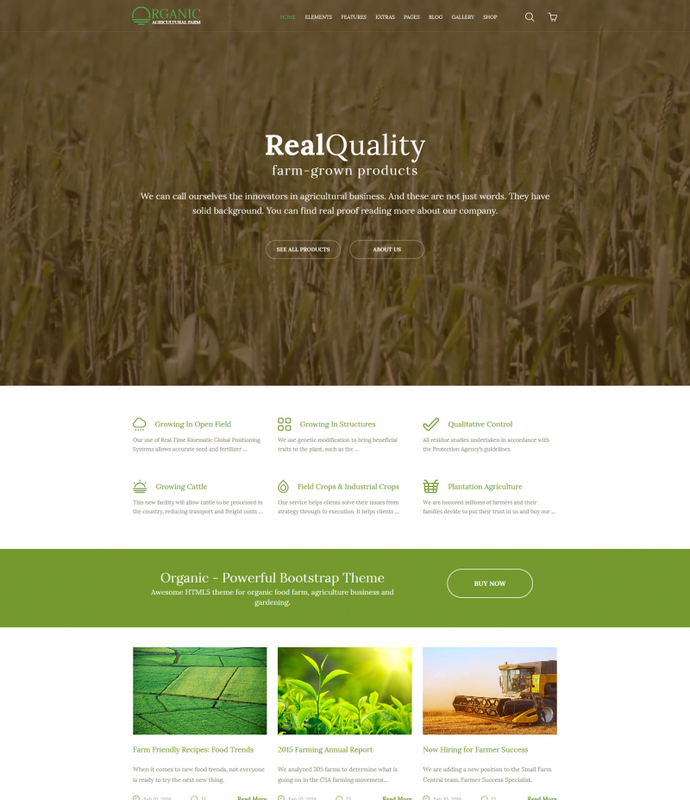 A perfect agriculture or industrial website should make a client’s journey pretty simple – and that’s what this design really does. This template’s emphasis on content means it is suited for a web page of any area just replace the imagery with your own and you’ll get a totally new style. Social sharing options enable building a huge group of fans on famous social network sites. 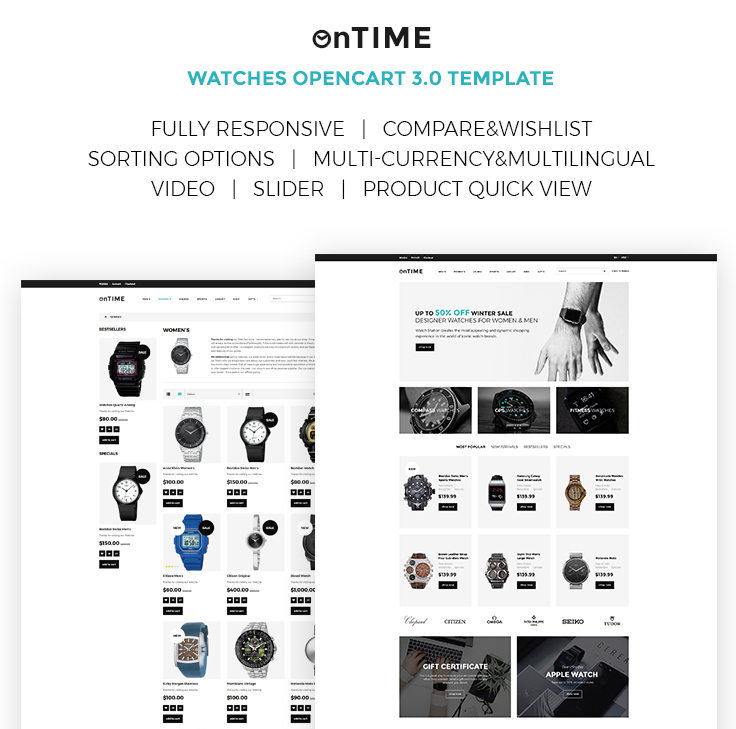 Build conversion-optimized watches and accessories stores with this OpenCart template. All of the theme’s components are fully customizable, so it won’t be an issue to set up it according to your requirements. Click on the demo button and check out the design in action. Create your online resource even more productive with this custom skin. A descriptive documentation directory, as well as free 24/7 support, are provided. Check out this theme made with the top SEO techniques in view and create a well-performing website with an attractive design. This template is fully responsive, therefore it won’t be difficult for you to reach site visitors from handheld and desktop devices. Generally, the template was coded with valid HTML and CSS techniques. A lot of template settings can be changed on the fly through the usable admin panel. It boasts a nice and clean page layout that guarantees the users focus on the offered content. 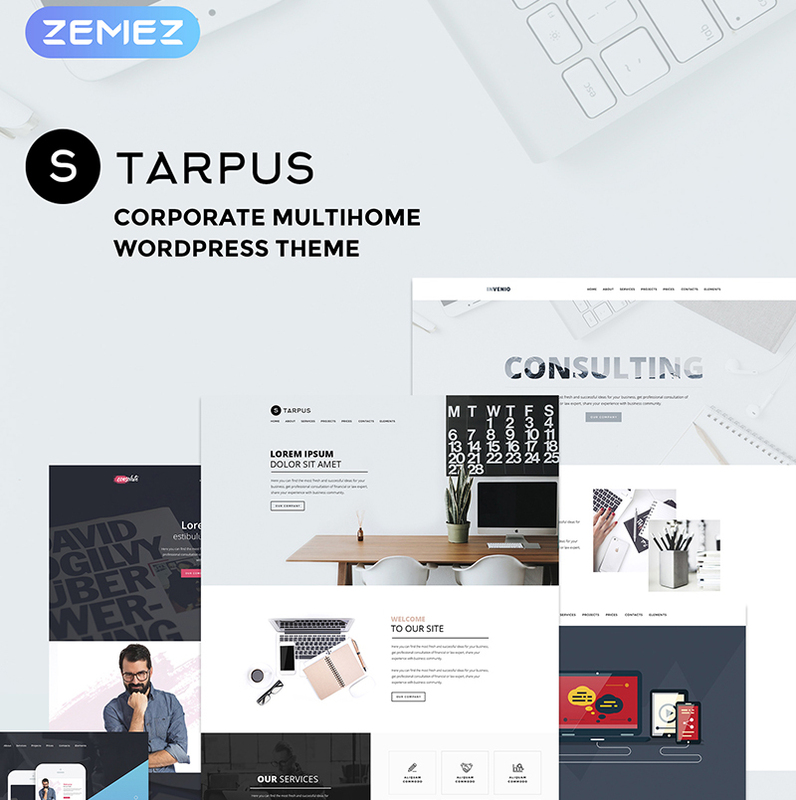 Starpus is a multipurpose WordPress template that lets you present your business story, its solutions, and services in a powerful way. This template is ideal for financial and business web projects. The theme is built with the mobile-first paradigm. It features a number of ready-made pages that will fit for all occasions. Elementor page builder makes it possible to modify the theme code-free. 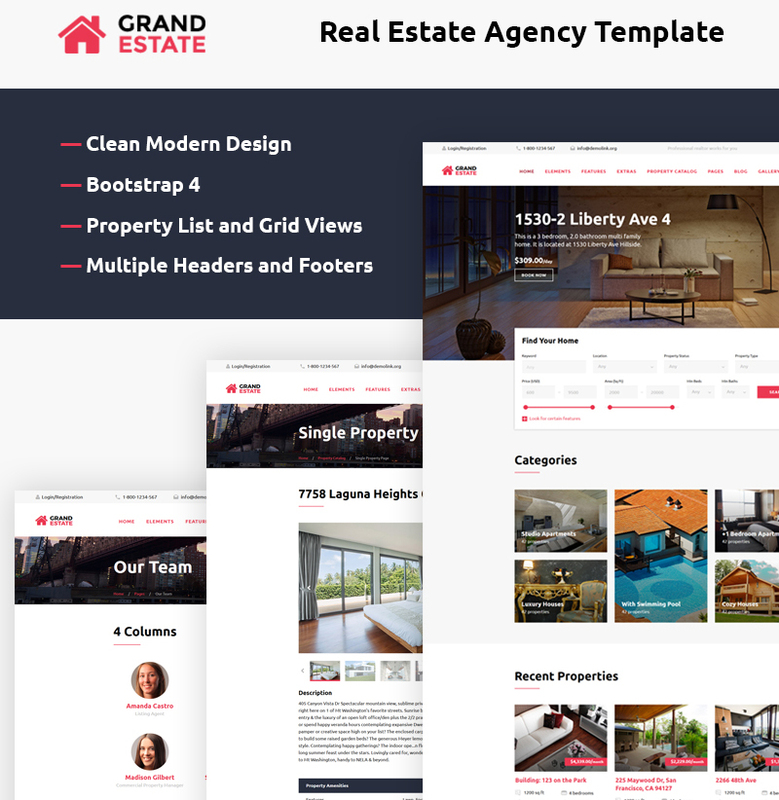 Deciding on this premium Bootstrap-based web template, you can build a site for any real estate or design project. Most of the template configurations can be customized on the fly. The template with such type of impressive design stands out among the many various other templates and will capture the attention of the web users. The theme is integrated with the advanced property search, which makes it the ideal fit for real estate websites. A variety of header and footer variations, pre-designed pages, blog variations, and UI elements are provided for the quicker customization of the ready-made design. If you’re looking for a modern and professional design for your site, then this WordPress theme is the right choice. This responsive design is an excellent choice for a number of home services sites. Included blocks of content, widgetized elements make the design of the template clear. SEO-friendly, it can be effortlessly found by users regardless of what search engine they are using. 100% responsive layout offers an optimal multidevice experience. Richly documented and presenting free of charge round-the-clock assistance, the actual web theme will allow you get moving with your web project right away. 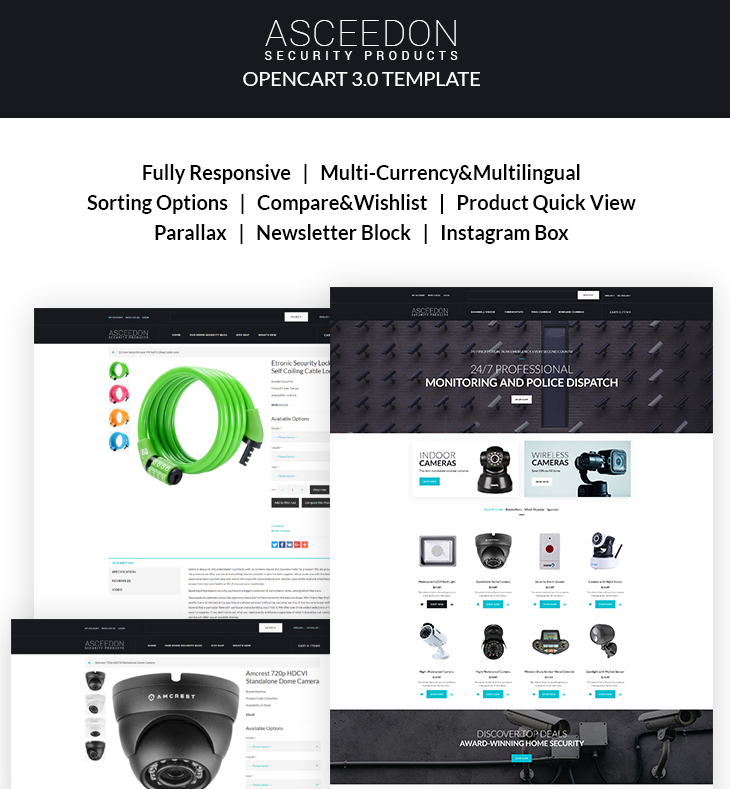 Deciding on this professionally designed OpenCart template, you can create a web store for business services companies. Developed with neat and valid HTML5 and CSS3 standards, this responsive Bootstrap –based theme will breathe clean air into the online projects of any level of difficulty. If you choose your venture to be seen on the web, then you should try this multicurrency and multilingual theme. The theme includes a range of the eCommerce options. Social media widgets are included to keep the audience more engaged with your content. 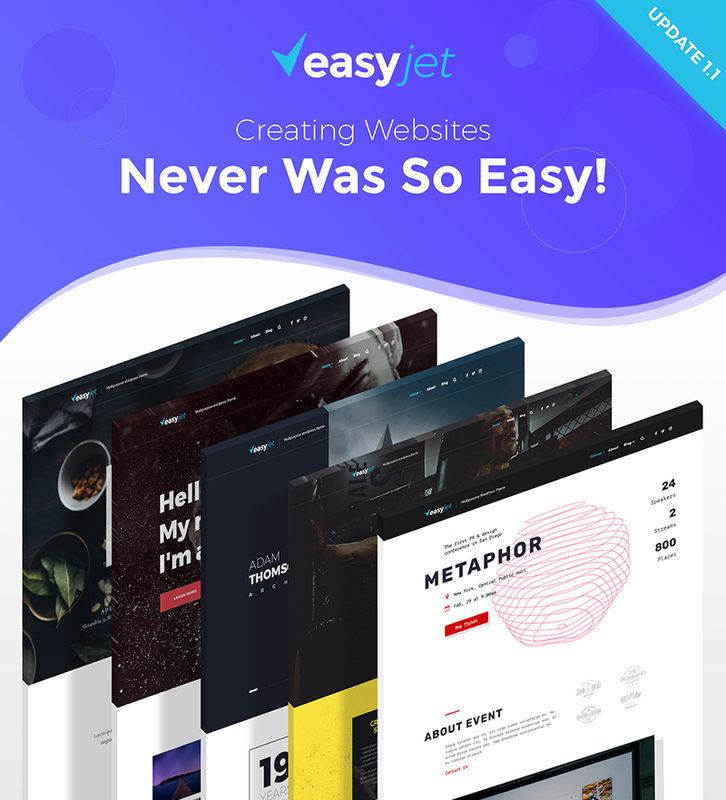 The website template features a bundle of pre-designed pages, which will help you get yourself a ready-to-run website in no time. 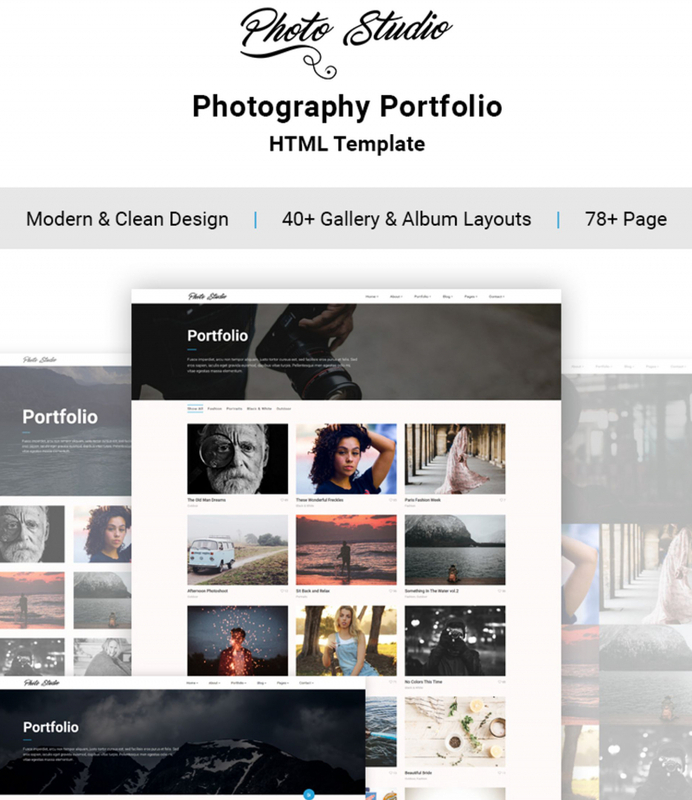 This Bootstrap-based website template looks like the best fit for photographer portfolio or freelance photographer portfolio. It ensures that your site will look equally great on any gadget that has web browsing, whether it be a desktop PC, a tablet pc, a mobile phone or even a smart TV. Check out the live demo to see it in action. Search engines and social media sites are commonly called the two main traffic suppliers, and this theme is optimized for both of them. This WordPress template features a stylish and attractive appearance along with a set of powerful features. 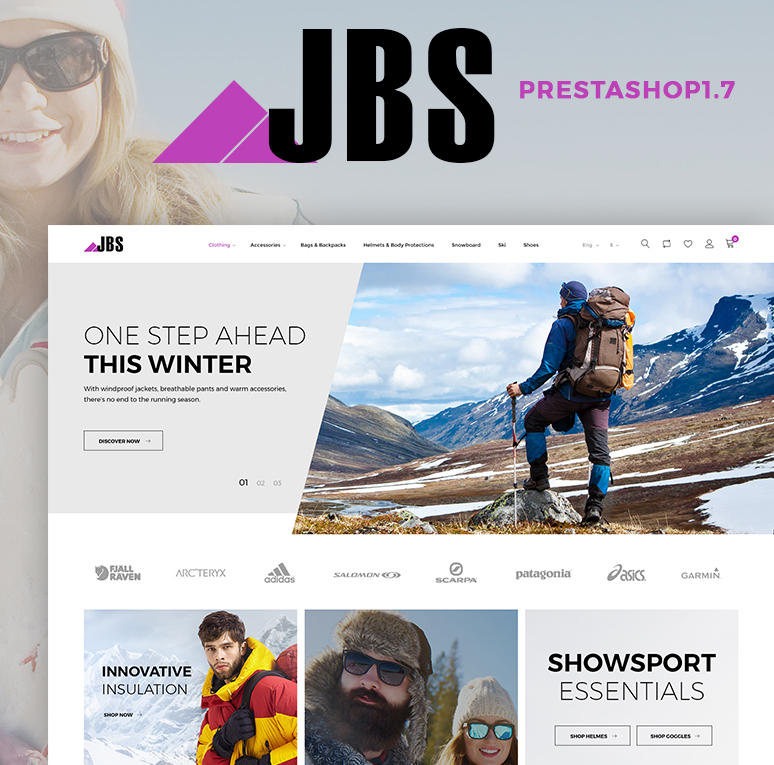 This fresh modern theme is very straightforward and easy to customize to meet the needs of multiple personal and business projects. Thanks to its fully responsive nature, you will effortlessly reach clients who surf the web on the go, while search engine-friendliness will let you enhance traffic rates of your web resource. Customers will enjoy seamless browsing around your website as a result of its intuitive site navigation and content-wise structure. Choose this WordPress design to make a professional website for your business or private projects. This layout is quite suitable to deliver business and consulting services on the net. Furthermore, it is responsive, which means that it behaves equally well on devices with various screen resolutions. The contemporary uncluttered design will convey the ideas of your online project in an easy-to-perceive way, and welcome the customers to find out more. The theme includes Elementor page builder, which allows you to create versatile designs in the intuitive visual interface. This particular WordPress template is a great option for people that plan to develop a classy and functional site. The template is perfect for life coaches and consulting specialists. 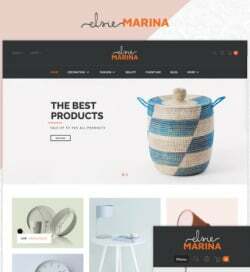 This web theme may become a perfect basis for different online projects. 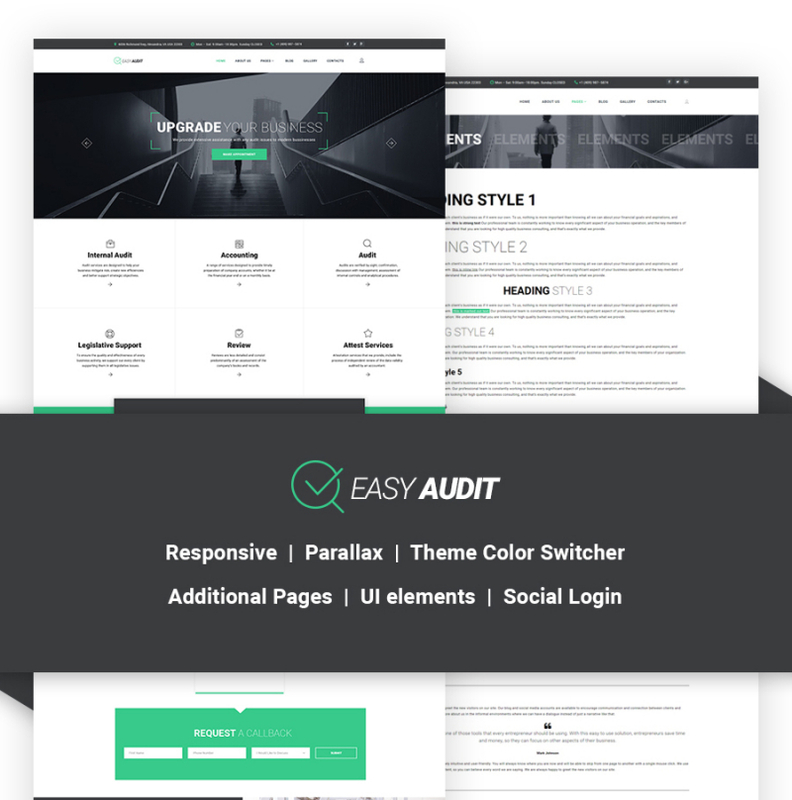 The theme contains a number of pre-designed pages, which will help you build a usable and information-rich website worry-free. 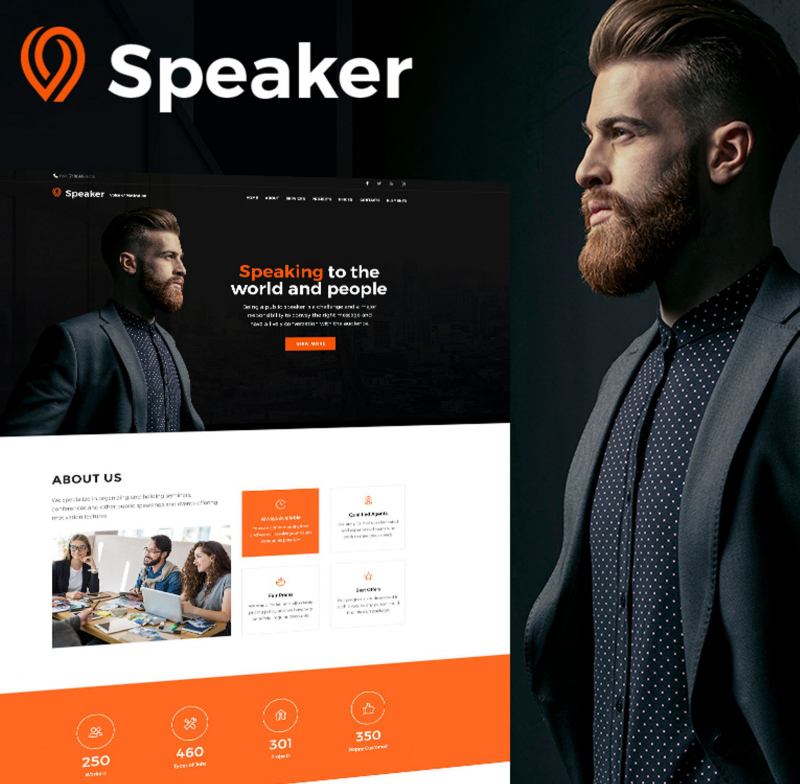 Speaker is a mobile-first template, which guarantees that the users will enjoy a seamless site browsing experience on-the-go. Elementor page builder makes the theme suitable for beginners and pros. 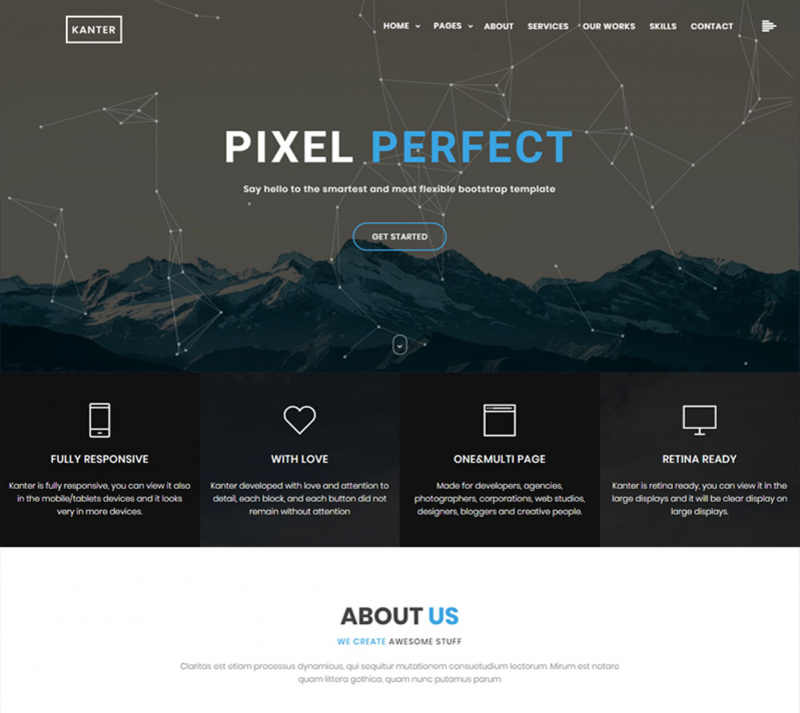 This Minimalistic HTML Website Template is a perfect fit for any creative project of yours. The website design is an incredible pick for photo album portfolio or freelance photographer portfolio sites. Its well-designed page layout facilitates sharing the wide range of offers and presenting your services in detail. Being integrated with popular social networks platforms, the template shown here can be an ideal tool to get in touch with your clients. The responsive newsletter template is a smooth and cutting-edge design for marketing specialists. It is a combo of visual aesthetics and features. Picking out the design as a platform for a web page, you can comfortably alter it to suit your needs. Check out the live demo to see it in action. Up to date pre-made web design with the well-structured layout and intuitive site navigation make this template simple, easy and pleasant to use. 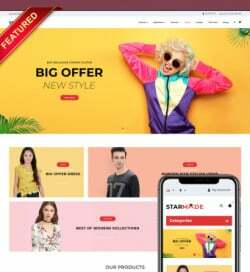 Make use of this Joomla theme built in accordance with website development requirements and modern appearance to start or redesign your site. This theme you can see here will allow you to deliver online any type of project representing a professional photographer portfolio. Included blocks of content, widgetized elements make the design of the template clear. Dressing up your web page with this design you will have the ability to create a first-class resource that will come in handy for the clients and be rewarding for you. Various design options are incorporated to help you choose the most optimal approach to showing your project on the web. Developed with neat and valid HTML5 and CSS3 standards, this responsive WooCommerce theme will breathe clean air into lingerie shops. This pre-made web design is a powerful and user-friendly solution that has been created by the professional web designer that knows everything about the most current developments in web design industry. 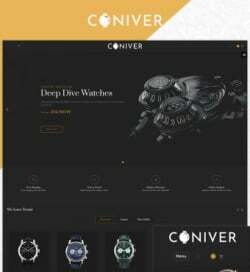 The core of this theme is centered on the fundamental techniques of today’s website development. All content will be properly showcased on different display sizes and across all popular browsers. 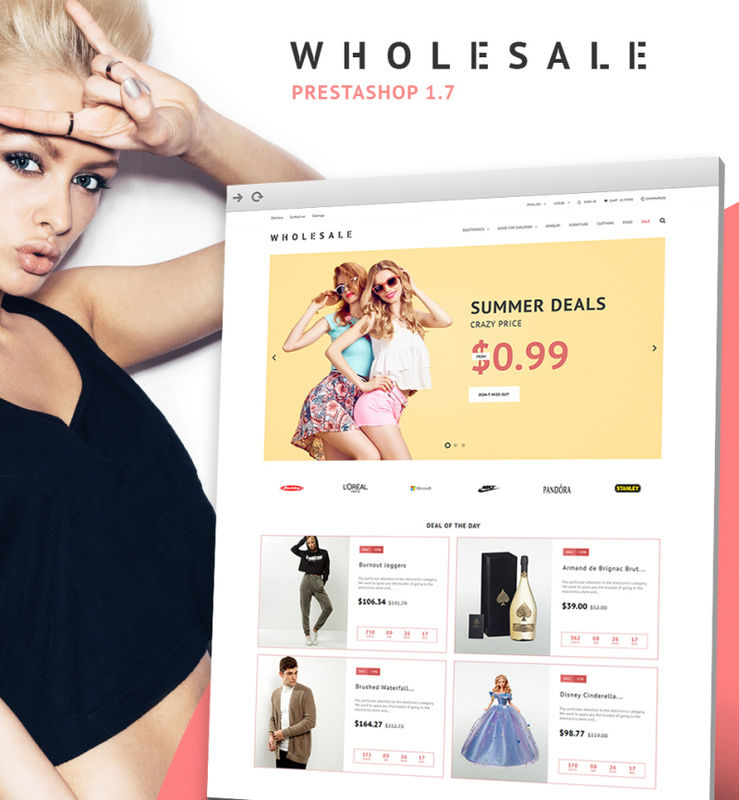 This wholesale PrestaShop theme looks professional, just the way every site should be. 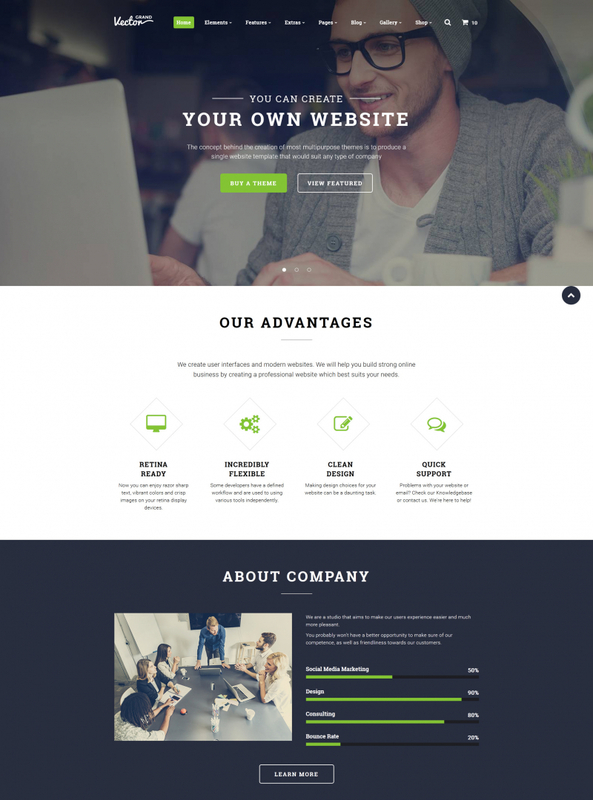 This Bootstrap-based web theme is an excellent web design for business and services websites. Most of the template configurations can be customized via the usable dashboard. The theme can be displayed flawlessly on a variety of electronic devices and monitor resolutions. A detailed documentation file, as well as free round-the-clock support, are bundled. This particular business Joomla theme is a robust basis to boost your website on the web. Use this theme for creating a fully functional personal or corporate web project. This fully responsive web theme is a functional product with nice typography and well-balanced content areas. 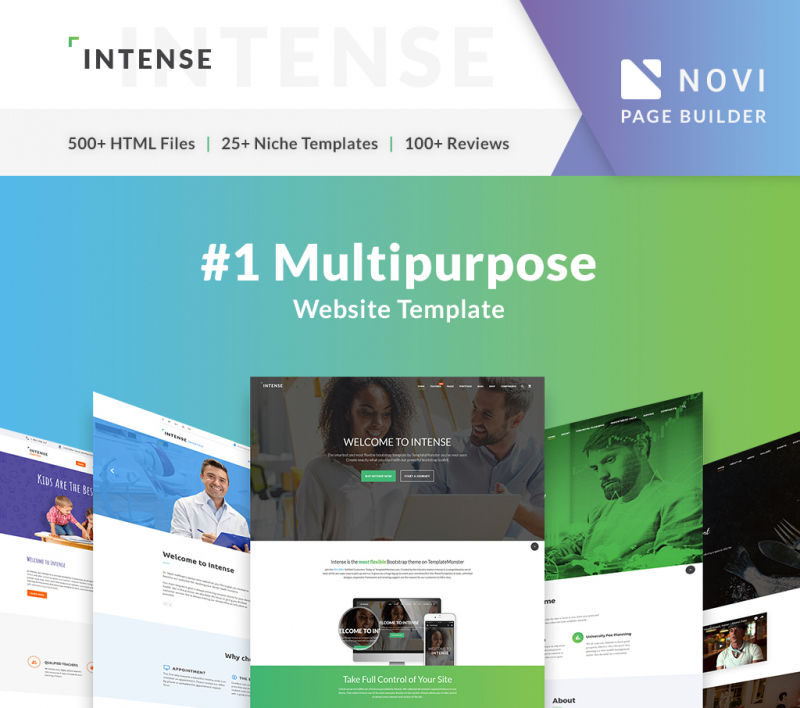 The theme includes extra page templates, several working forms, and a rich UI kit, which will help you bring the desired style and functionality to your future web resource.